The Navy received its first operational MQ-4C Triton drone when the high altitude, long endurance unmanned aircraft landed at a Navy facility at Point Mugu, contractor Northrop Grumman announced Nov. 10. The company said it expects to deliver a second Triton later this year. Early next year, the Tritons will fly to Guam where the Navy is expected to make them officially operational, Thomas Twomey, senior manager of business development at Northrop Grumman, told C4ISRNET in April. 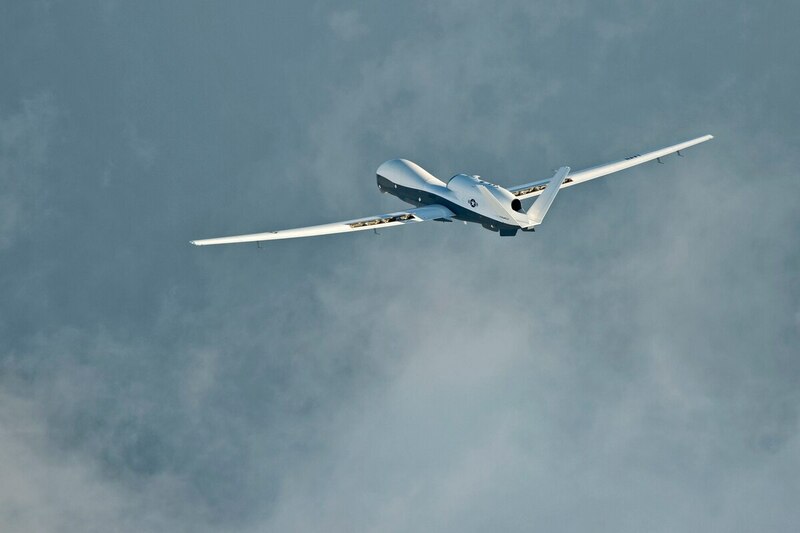 The MQ-4C can fly for as long as 24 hours and at an altitude as high as 55,000 feet. A small skeleton crew will perform launch and recovery tasks and then a larger group will fly the Triton remotely from Naval Air Station Jacksonville, he added. A maintenance detachment for the Unmanned Patrol Squadron (VUP)19 is located the Naval Base Ventura County Point Mugu and will prep the first two Tritons for Guam. Triton evolved from the Broad Area Maritime Surveillance—Demonstrator, or BAMS-D, which has been operational for the last seven years in the Middle East serving the 5th Fleet, Twomey said. While the BAMS-D informed many of the requirements for the Triton program, more importantly it gave the Navy experience operating an autonomous persistence maritime surveillance asset; Twomey noted that 5th Fleet doesn’t perform carrier transits without that asset flying above. The Triton program is set to meet early operational capability in 2018, with initial operational capability slated for 2021. The delay in the latter milestone occurred due to a need for a multi-intelligence capability, Twomey said. With the retirement of the EP-3 surveillance aircraft, the Triton will pick up the intelligence and surveillance slack in terms of payload and capability. Triton could meet IOC a year from now, Twomey said, but with the multi-INT capability, it likely now won’t reach that milestone until 2021. The early operational capability does not include the multi-INT function. “This aircraft represents the beginning of a new era for Naval aviation,” said Doug Shaffer, vice president of Triton programs at Northrop. The Navy has announced plans to deploy Triton to NAS Mayport, Florida, NAS Sigonella, Italy and the Middle East in the future, Northrop said.